Options available to protect your pride and joy paint finish from stone chips or scratches has become big bushiness in today’s market place. 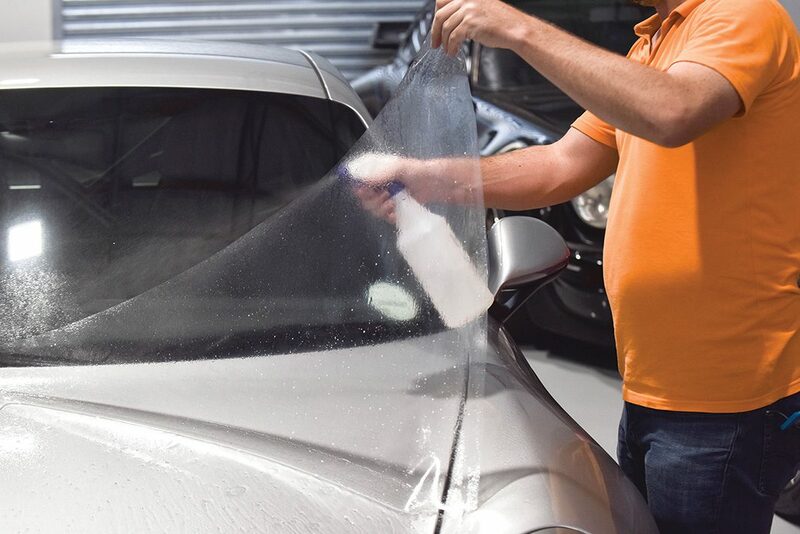 Paint Protection Film (PPF), for vehicle protection, has rocketed in popularity over the last several years, and as demand has grown, so has the number of manufacturers and installers. 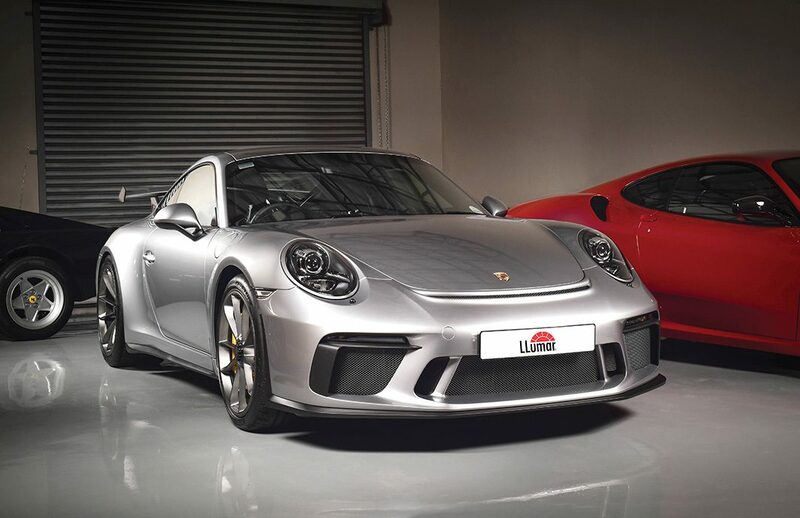 LLumar, with over 60 years of experience in the performance films industry, has one of the highest quality, most durable paint protection films on offer. Automotive Refinisher looks a little deeper into the make-up of this highly durable, lightweight multi-layered technology that has taken the industry by storm. First up is the self-healing top coat of LLumar PPF, which is a high gloss clear coat. Thanks to its film-like properties, it is super smooth. This advanced top layer retains the ability to ‘flow’ even after the paint protection film has fully cured. This means that it’s self-healing properties are flexible enough to return to their natural level after being scratched or nicked, for example a stone chip. Sunlight is a key ingredient to speeding up the healing process of the layer to automatically repair itself. Next up is PPF’s thickest, most central component: the protective layer. Uniquely engineered, extruded polyurethane is the material used for this layer, because it offers optically clear, superior resistance to surface impact, UV rays, heat and water. This state-of-the-art technology is a three-way safeguard against environmental elements that can compromise the radiance of your vehicle’s finish. Impact resistance shields against damage from anything that strikes the surface of your vehicles and bounces off, such as gravel. It also helps with anything that’s dragged across the surface, such as a suitcase you’re removing from the boot. UV rays and heat resistance maintain the integrity of the films properties for much longer. Higher water resistance also means higher stain resistance, which can be especially important for lighter colours. A high level of water (and stain) resistance is one of the key differences between a standard PPF and the premium quality LLumar PPF. In addition, LLumar’s Platinum PPF incorporates their industry leading Hydrogard™ technology, designed to add additional water resistance and enhance the durability of your vehicle’s exterior. This innovative hydrophobic polymer coating works by preventing water and dirt from embedding into the surface of the film, helping keep cars looking cleaner for longer. Last, but not least, is the adhesive layer of PPF because adhesive plays such a critical role in smoothly attaching film to the contoured shape of a vehicle. When film and surfaces adhere properly, installed PPF is virtually undetectable. This is why an adhesive with a ‘soft’ quality is preferred. That softness allows film to be lifted and refitted multiple times, for the most desirable placement, without the risk of leaving adhesive marks. The result is an ideal film-to-surface fit, with a brilliant finish. It’s extremely difficult to stain LLumar PPF with organic compounds such as insect or bird droppings, and environmental contaminants such as oil or even exhaust smoke. This is because top coats have very low surface energy, and so stains such as these simply don’t stick. Still, unusual materials or long exposure can cause occasional stains. Simple isopropyl rubbing alcohol can remedy most stains that don’t come off during normal washing. Sparing amounts of lacquer thinners or bug and tar removers can also be used, but you need to stick to what is suggested in the LLumar warranty before you apply them. 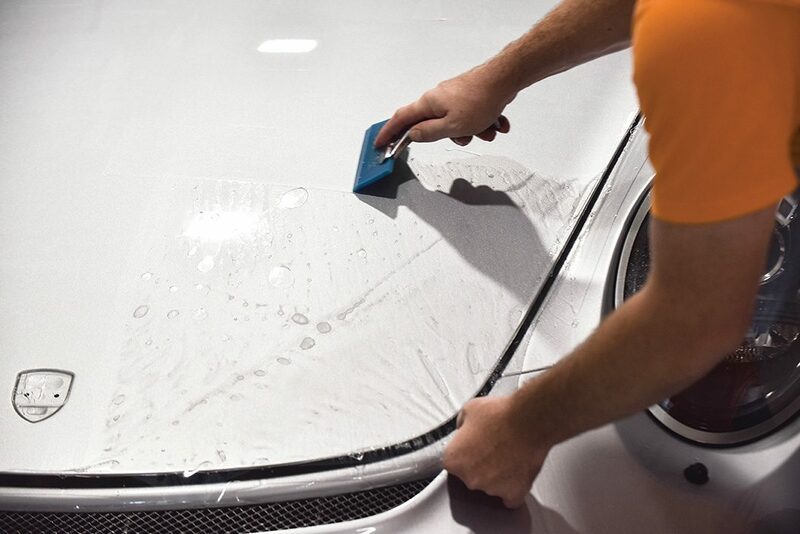 LLumar PPF, with its self-healing top coat is designed to heal surface scuffs and swirl marks that occur during routine washing and waxing or polishing. Minor scratches such as these heal almost immediately and there is no limit to the number of times a top coat using LLumar technology can heal itself. Deeper scratches in a self-healing top coat take longer to heal. Along with scratch severity, heat also affects the healing process. You’ll notice accelerated healing if your vehicle sits in the sun or if you pour hot water over a scratched area. If PPF is penetrated by a scratch, it can be removed and replaced by an individual panels. Subject to certain restrictions, LLumar PPF offers up to a 10 year warranty against cracking, bubbling or yellowing caused by defects in manufacture or materials. This warranty is a market leader currently. Automotive Refinisher were on hand to witness a Llumar PPF installation and the final product is a pefectly smooth high-gloss wet-look thanks to the products film like properties. So if it’s maintaining the value of your pride and joy from knicks and scratches and protecting it’s paint work then there is no mistaking the performance of this paint protection film. There are many options available to the general public in terms of car coverage so check out their website for more info and get a safe guard which will keep the luster alive, on your favorite in the garage, for a long time to come.